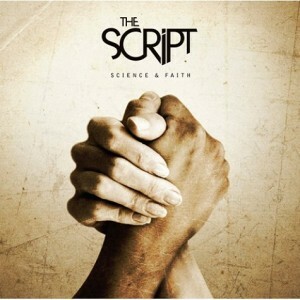 Though their self-titled venture that was released back in 2008 received rave reviews and spawned five hit singles, The Script seemed to have taken a step, possibly several, back with new record Science & Faith. While The Script provided us with semi-catchy pop songs about the supposed inescapability that is the troublesome yet rewarding ritual of relationships, I think it’s fair to say that no matter what the band did with album number two, it was going to be on the wrong side of criticism. For those who expected something more than just another compilation of break-up, make-up stories from the Irish rockers now’s the time to bow out. You Won’t Feel a Thing, as the opening track, under delivers. Everything about it, from the light poppy guitar beats to the reappearance of lyrics like ‘I will take it on the chin for you’, is so expected that its rightful place should have been the first record. The Script’s motto for the modern man seems to state ‘be courteous and happy no matter what’. That’s all well and good but when a band ceaselessly repeats itself, it starts to make listeners grow weary. So much so, that the rest of the record resembles the dreariness of the infamous chick-flick genre – four minutes in and we all know how it’s going to end! The single For the First Time, and subsequent video, depicts a couple who rediscover the spark in their relationship once they both fall into unemployment. A fitting choice of romance in view of our country’s current state of affairs! It’s a model Script song – morally conflicted yet ultimately uplifting with lyrics ushered in a harmony, heck there’s even a big crescendo with a fusion of instruments. Regrettably, originality is such a scarcity within the pop industry nowadays that a lot of acts won’t try their hand at something new because of a fear of being anything but praised. Maybe I’m alone in this train of thought but give me innovation any day over a tiresome technique. At least that way, it looks like the act is trying. Lyrically, the song Nothing is reminiscent of If You See Kay but instead of a guy kindly asking for Kay and sending her his love, here the guy enjoys a few scoops with his mates at the local, then wistfully pines and confronts the ex who gilted him. Nothing gives us just that, it adds nothing to their repertoire. The trio do put together a pleasant sounding song but it’s just a tad difficult to take singer Danny O’Donoghue seriously when all he wanted was words but all he got was nothing. From where I stand as a listener, our boats seem mighty similar. As with The Script, each song’s strength lies within its chorus. Most of the rhymes don’t stick after you’ve set the record aside but they’ll certainly have you bopping around during the moments you’re listening to it. The track Science & Faith isn’t a stretch from their customary chipper manner as they tell us we ‘won’t find faith or hope down a telescope…’, it begs the question where do we look? Well, most won’t need me to fill in the blanks. If You Ever Come Back doesn’t seem like an entirely realistic tale, I mean who’s response to being alone is ‘I’ll leave the door on the latch if you ever come back’? The up-tempo beat that’s characteristic of the band shines a light on the brighter side of life that carries through to songs like Long Gone and Moved On and This = Love which reminds us that ‘love is why we do it’. If Science & Faith was supposed to show the growth of the band and the honing of their musical skills from record one to two, then it disappoints. Both The Script and Science & Faith are grand to stick on when one chooses to unwind. While the former has more than a handful of songs that deservedly made the charts while still sounding similar, you could easily listen to the latter and not realise that you’ve gone through the entire record. This happens because there are no significant milestones to grab your attention. Still, Science & Faith will be an album that will be as equally cherished by fans as their début was. There’s little if no difference between the two. Science & Faith is, by all means, a sequel record and, as the story goes, sequels tend to fall short of their predecessor. The Script has shown us that they are good at delivering pop songs about the trials and tribulations of relationships but they’ve yet to stray from that tried and tested method. There is no doubt about their ability to accomplish that, Science & Faith is basically The Script, but is that all they’ll ever be? Will they go beyond their reused method that’s only helping them add to a steady collection of heartbreaks and buried hatchets? Maybe the reason why The Script dodged the chance for originality and ingenuity was due to the possibility of having to dethrone their pedestal if they experimented. But bearing all this in mind, Science & Faith debuted at number one in the Irish charts, it seems that no matter how conventional and uninventive the band becomes, they don’t need to trouble their heads because there seems to be enough people who are content with purchasing the same humdrum over and over and over … and well, it’s endless.